Our presence has become known and will continue to do so with deep commitment, offering high quality ships and safety for all of our users. Maintaining and improving on our leading position in supply of maritime services by offering our cargo customers and passengers the highest levels of safety, comfort, cargo handling and logistical operation. 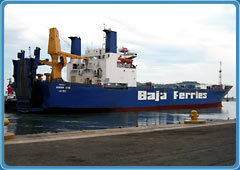 To be a shipping company with high social responsibility, that by professional attention to the passenger and the cargo, maintains the fleet modernization by means of the ships constructions with capacity of 3,000 linear meters of cargo and 2,000 passengers, and guarantees quality services contributing to a commercial, tourist, and social trustworthy development for the benefit of the area and the users. It was built in 1989 in the Mitsubishi H.I. shipyards in Kobe Japan and it was bought by Baja Ferries in February 2008. Prop (height): 48m This ship reaches a speed of 23 knots, which is equivalent to a speed of 42.7 km per hour. It has a cargo capacity of 1,800 linear meters, 60 cars and 1,200 passengers including the crew. The crew consists of 52 people. 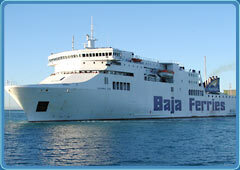 It was built in 2001 in the Candiere Navale Visentini shipyards in Italy, and was bought by Baja Ferries in 2003. Prop (height): 52m This ship reaches a speed of 20 knots, which is equivalent to a speed of 37 km per hour. It has a cargo capacity of 2,200 linear meters, 100 cars and 900 passengers including its operators. The crew consists of 49 people.. It was built in 1978 in Rijeka the former Yugoslavia Republic, now Croatia, and it was bought by Baja Ferries in 2006. (height): 13.40m This ship reaches a speed of 16 knots, which is equivalent to a speed of 29.7 km per hour. It has a cargo capacity of 1,100 linear meters. 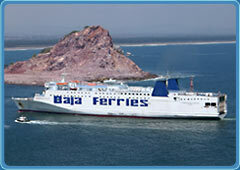 It is a cargo ship by contract with the route from Manzanillo to La Paz. The crew consists of 33 people. • You will be requested to show an official ID when boarding. • If you are traveling in a stateroom please carry the minimum necessary luggage for a short trip. • The ports of Pichilingue, Topolobambpo and Mazatlan are operated by the API (Administración Portuaria Integral) it includes the parking space, patios, waiting room, restrooms and other facilities, Baja Ferries is not responsible for these areas or for the events that may occur in such facilities. • Entrance to the Ports (A.T.P.) It does not include other port rights. • These regulations are subject to change without previous notice. • These fares are subject to change without previous notice. • If you are traveling with a child under 3, request his/her ticket without any charge. • You are not allowed to have your luggage on board in the halls area; you must document it before boarding. • You are not allowed to transport frozen seafood on board in your luggage or in ice buckets. • We are not responsible for the valuables that you may carry inside your luggage. • Children under 16 of age are not allowed to travel alone. • You are not allowed to resell or exchange your ticket. • The pets traveling inside your car are your responsibility.